I had been losing things in my studio for a few years even though I'm pretty sure they never left the room. I also didn't have space to work without clearing off the tops of my work tables at the beginning of a work session. I started looking through some books on art and craft studios to see if I could find solutions to making my workspace more usable. 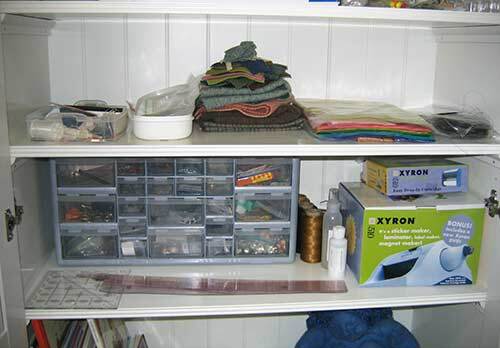 Dream Sewing Spaces: Design & Organization for Spaces Large & Small byLynette Black and Creating Your Perfect Quilting Space: Sewing-Room Makeovers for Any Space And Any Budget by Lois L. Hallack were especially helpful for practical ideas. 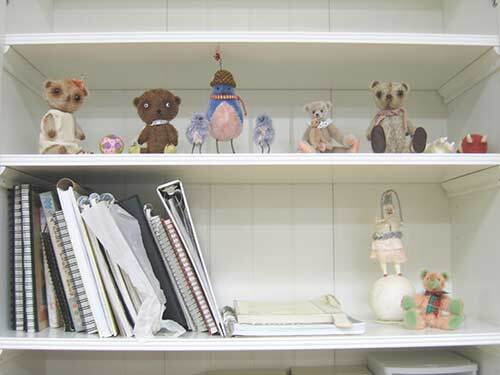 Where Women Create: Inspiring Work Spaces of Extraordinary Women by Jo Packham is good for inspiration. I also really studied what was in my studio to see if there was stuff that didn't have to be there. The first things I noticed that could be moved were thirteen years worth of homeschooling books - both how-tos and subject resources. A photography setup was taking up most of the surface of one work table. Supplies and tools were stored on tables because the closet was full. My daughter took the books she wanted to use into her room. Others would be moved to the basement. Then we decided we had to make the basement usable for storage. We found a dehumidifier that could be connected to a water pipe in the basement, and our basement humidity went from 72 to 40 percent. We painted the walls white and put up some storage shelves. I found a simple chair and table at IKEA that worked well for the photography setup. Then we moved books, photography stuff, and supplies that aren't used regularly into the basement. I was left with more usable work areas and an empty wall space that could hold a big storage cabinet. We went back to IKEA and found a large white cabinet with various door options. I picked matching doors with glass inserts on the top. Inside, I put sketchbooks, some finished critters, work in process, and a few pieces by other artists, patterns, small wool and mohair fabric pieces, needlefelting supplies, stuffings, and my little xyron machine. There was room for some plastic drawer units from Home Depot and hardware stores that I could use to store beads, glass eyes, teddy joints, small tools, a set of French curves for drawing smooth curves on patterns, and some accessories. We also found some nice cardboard and wooden storage containers at IKEA to hold mohair scraps that are big enough to use for future projects, balls and hanks of pearl cotton thread, ribbon, and vintage accessories. These come in flat pieces and have to be assembled, but they aren't difficult projects. Mohair -- I love the stuff! It's the fleece from Angora goats, sheared like sheep's wool. In another life, it was my favorite fiber for spinning, my favorite hair for dolls, and now I use mohair fabric for my bears and critters. 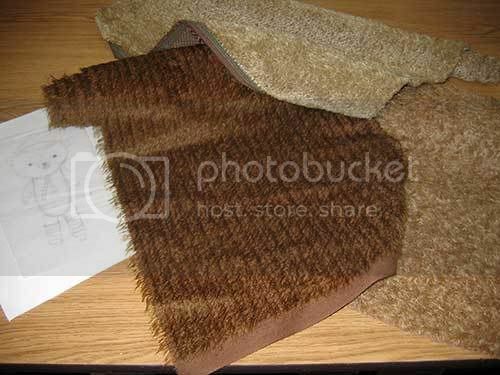 It is soft, fluffy, stiff, matted, long, short, curly, straight, dense, sparse. Like most bear artists, I have a stash of it. (A big stash) I have found that it's not the easiest thing to store, as the fabric is wide, takes on creases where it is folded, and has a pile that I don't want to crush. 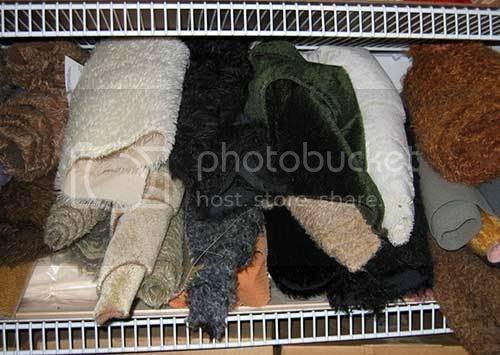 My mohair is stored on a shelf in my studio closet, each piece rolled (nap outward) into a tube. When I go to select a piece of mohair for a project, I usually have an image in my mind of what I want to make and have sketched a drawing for reference. I go into my studio closet and start pulling out pieces I think might work well for the design. 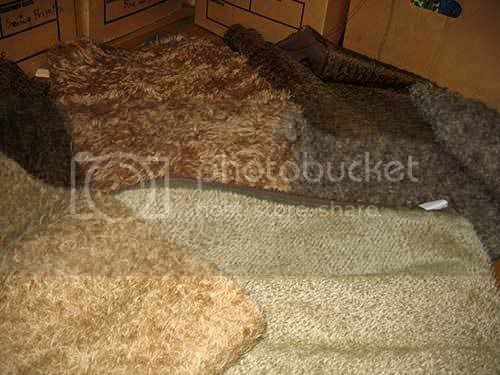 Soon the floor is covered in various shades of mohair. Then I take 3 to 4 pieces to my work table where I play with and manipulate them into semblences of three- dimensional shapes. I want to see how they react to being curved and bent, how the pile moves and changes, and if the base fabric is visible when the fabric is curved, do I like the effect. I pick one, but the others may be tucked into the back of my mind as possibilities for future projects. You can read more about mohair here and here.